Situated mid-way along the south coast of Kos Island, Kardamena is one of the most popular resorts in Greece. Once a small fishing village, the town is now very commercialised, with scores of English-style pubs and restaurants, and tightly packed apartment blocks. A wide variety of watersports can be organised from the long sandy beach, and the Kardamena resort is well-placed for those who want to explore the island's fascinating interior. Kardamena is packed with shops offering everything from designer clothes to tacky holiday souvenirs. Most are located around the main square. For those in self-catering apartments, there are some good supermarkets offering many well-known brands. There are also some interesting local markets, including one on Bodrum, across the water in Turkey. Visitors will find a wide choice of restaurants in Kardamena, from Indian and traditional Greek, to fast food establishments offering full English breakfasts. Many of the best Greek restaurants are clustered on the seafront. Though not quite Ibiza, the nightlife in Kardamena is still fairly intense, with dozens of bars and clubs catering to a variety of musical tastes. All in all, the scene is fun, vibrant and definitely dominated by tourists. Kardamena's main beach is ideal for lazy days in the sun and watersports, which include jet skiing, snorkelling and scuba diving. Nearby Helona Beach has Blue Flag status. 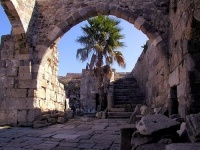 Visitors will also find fascinating historical sites scattered around the island, particularly in the capital, Kos Town. Boat tours can be arranged to the spectacular volcanic island of Nisyros, and to Rhodes. Holiday visitors should be warned that all the bars on the main strip along the Kardamena seafront have loads of touts working for them, trying to get tourists in. This can become annoying after a few nights. Drinks can be expensive, by Greek standards.